I had grand plans to share a pot pie recipe for Thanksgiving today but we’ve entered a new era of short naps which meant, I’ve not had a ton of time to shoot a slightly more intricate recipe. 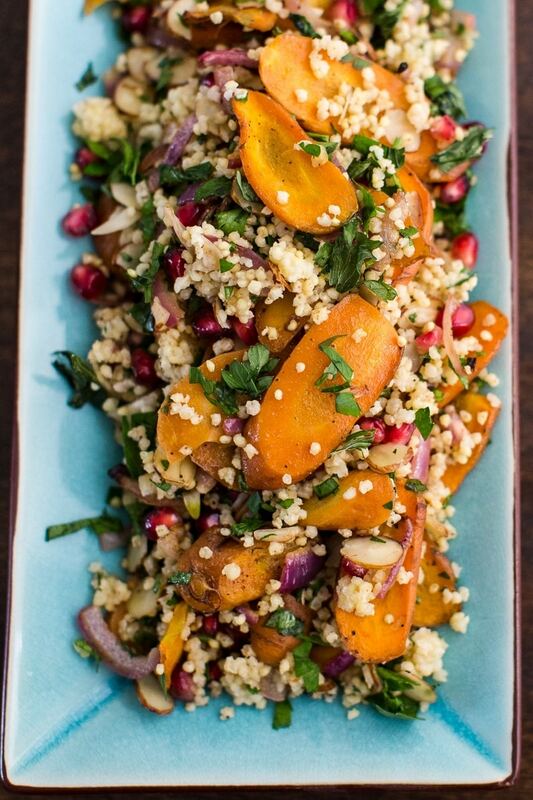 Enter this Moroccan Carrot Salad. It can easily be cooked and assembled in about 25 minutes, has a ton of flavor, and is vegan/gluten-free. While you can buy a Moroccan spice blend (Ras El Hanout), I think it’s easily blended at home with spices you most likely already have. I’m also a bit loose with dressing for this salad as I find it really takes knowing your taste and adjusting accordingly. Squeeze some lemon juice and drizzle some olive oil on top. If the balance isn’t right, add a bit more. There’s no hard and fast rules here. This salad relies heavily on the spice mix linked to below. You can buy pre-mixed Ras El Hanout but it’s easy enough to make from spices you already have in your pantry. Preheat oven to 375˚. Cut carrots on the bias,, about 1/16th of an inch thick. Place on a sheet tray covered with parchment paper and toss with onions, 1 tablespoon olive oil, and spice blend. Roast carrots until browning and tender, 20 to 25 minutes. While the carrots are roasting, combine millet with 1 cup water and a pinch of salt. Bring to a boil, reduce to a simmer, cover, and cook for 18 minutes or until most of the water has been absorbed. Remove from heat and allow to sit for 5 minutes. 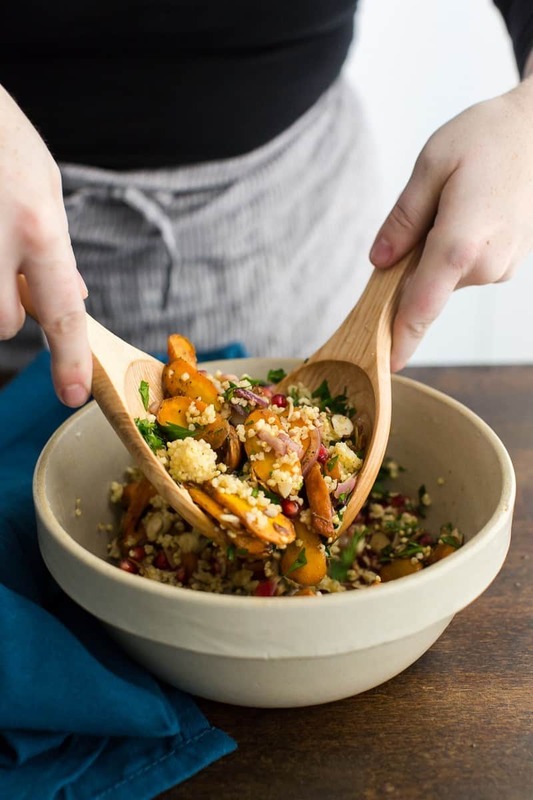 In a bowl combine the roasted carrots, millet, almond slices, pomegranate seeds, and herbs. Squeeze lemon juice over salad followed by 2 tablespoons olive oil, adding more as desired. Toss together, taste and adjust salt/pepper to taste. Tips and Tricks: The method I use for the pomegranate is to cut a whole pomegranate into quarters and working in a large bowl of water, remove the seeds by hand. This prevents splatter all over the kitchen! 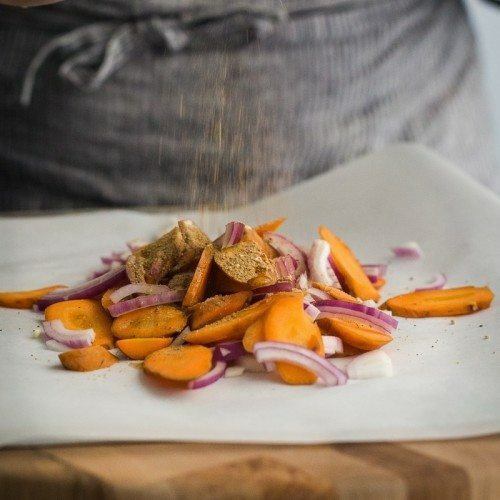 The sweetness of the roasted carrots is essential to the overall flavor of the salad + Moroccan spice blend. Plus, the carrots roast up rather quickly, making this the ideal meal or side. Make an extra large batch of the spice blend to use on other roasted vegetables. Carrots: If you don’t have carrots or aren’t a big fan of carrots, sweet potatoes would be the next option followed closely by parsnips (not as pretty but I do like the flavor). Greens: If you’re looking for more of a salad, toss the final mixture with lettuce or fresh spinach for a nice salad. Let the carrots/millet cool before doing this. Additions: For amping up the protein, try adding chickpeas and/or feta. I thought the salad was great without either but my first choice addition would definitely be feta. I always knew about millet, but only recently started using it a bit more. I still have some troubles with it in salads, I noticed that it clumps quite a bit when cold. This salad sounds delicious, perfect for winter months when heartier salads are what I need. Pot pie sounds delicious, but this looks beautiful. I love the combination of the pomegranate and ras el hanout. And I know I’m more likely to pull together a salad like this than a pot pie on any given day. Thanks for this recipe. The kids kept coming into the kitchen and asking what’s that smellllll…………. when the carrots were baking! 🙂 All of us loved it and since I didn’t have any millet at hand, the salad worked beautifully with couscous . It looks beautiful and delicious. I have not used millet but would like to try this recipe. I have been following your blog for a long time now. I just made this dish for dinner tonight and it was soooo good. I loved it! I made the recipe just as listed. I made this dish tonight since I had carrots and pomegranate from my CSA–I used cous cous as I didn’t have millet on hand, but I think millet might be a nice alternative. My cous cous was the Israeli kind and worked, but I think a chewier grain would have been better. Hindsight! Also, I think next time I’d toast the almonds. I love a toasted almonds! The flavors were really nice and the textures were great too–crunch, chew, fresh… Really yummy! And I have leftovers for lunch! Sounds delicious! Any thoughts on a different fruit to sub for the pomegranate seeds, if pomegranate is hard to get? Maybe wild blueberries? I’ve had a hard time coming up with a good sub because the pomegranates also add a layer of texture not found in the other ingredients. Blueberries might be nice though! Help please! I’m making this tonight and have never made millet before. The instructions that I have found ask for far too much millet that is required for the salad. 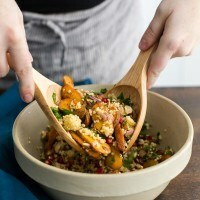 Can anyone instruct me how to make 1/2 cup cooked millet? It would only be 1/4 cup of millet with 1/2 cup of water in a small pan. I recommend making a little more and having leftovers to use in another salad or meal. I have made this now a few times, it’s really and truly delicious. There used to be a link to a ras el hanout recipe that worked well. Am I missing it, or is it no longer available? If it’s gone from your site, would you be so kind as to send me in the right direction? Thank you. This is such a delicious recipe. The spice adds so much flavour. A really nice change for a salad. Thanks for sharing. This was really yummy! I didn’t have pomegranate seeds on hand, so I used 4 medium, finely chopped dates (used in a similar salad I cooked from Blue Apron)– it turned out really well! I love the spicy-sweet-nutty combination. Thanks! We loved it! I did not have cilantro but added everything else. It came out great! I’m in love with this salad – its simple, delicious and really satisfying – It’s become a regular staple in my work lunch rotation. Even good without pomegranate seeds (which I only add when they’re affordable!) Thank you!